A question I received: Is playing the best way to develop? My Answer: Yes, a game is the best way to develop. It is the foundation of progress in nature. We think of a game as something plain and simple. But, a game, in fact, is the most serious thing in the world. When we stop playing, we stop developing. We evolve only through playing. When we play, we don’t realize what we are doing and as a result we expand our feelings and abilities. Later on, when we stop playing and start learning, we are only fulfilling the possibilities we have created with the help of games. This is what turns a good game into the foundation of a human being. His gradual development from one level to another, in accordance with the law of “negation of negation,” and the ascent from a state of the lower one to that of the Upper One, is possible only through a game. When playing, a person doesn’t realize what his next step will look like since he isn’t there yet, but he strives toward it, models it, and “tries it on” in various ways. This element is called “a game.” It is about uncertainty, unpredictability, intuitive attempts to figure out how, and acting like a child. This is what growth is about. People are well aware of this. Here is an example: during my doctorate exams, one of the examiners asked me to describe the elements of game in the development of nature and human beings. They also asked me to answer this question from the perspective of Kabbalah. So I had to present the whole system to them. (They accepted it, but gave me a “B.” I got a “B” in my major, in Kabbalah!) Why do I mention this here? It is just as an illustration of how commonplace the acceptance of play and gaming are today. A question I received: Our actions are unrewarded and the prayer of the society is beyond human ability. You need energy just to ask for this. So where do we start? Where will we get the energy to carry out these actions, which are beyond our nature? My Answer: We can understand this through the example of man’s development. He emerges as a result of mutual actions of the father and mother, then goes through lengthy development in the mother’s womb, and is born. His own forces start to surface in him, but of course this happens unconsciously. Even though we see that he reacts, it is clear that he is not doing it himself, but on account of the forces that are accumulating in him. They are causing the reaction. Where does one’s independence start to come through? Is it in the prayer or plea for oneself or for others? The Upper Light is the only force that acts upon us. It influences us without our awareness just like nature influences an embryo or a child. On our part, we try to evoke a greater influence from the Light, and thus accelerate our development. Therefore, we should simply make efforts. This is the only thing required of us. A prayer, a plea for correction, is the most natural desire, but the problem is that our heart does not want what is needed. Our desires are corrupted, and so we read articles by Kabbalists to learn what request we should form in our hearts. First, we need to correct our desires. When a sensation of the Creator is revealed in the very first, minor, corrected desire, we will know exactly what we should ask for in order to draw increasingly closer to Him. For this reason, the sages of the Great Assembly (Anshei Knesset HaGedolah), all of which were great Kabbalists, wrote a prayer book for us so that everyone could at least read about what a corrected heart should ask for. When we open a prayer book, we need to remember that we are reading about the very elevated states which we need to achieve. Along with the prayer book, we need a wise mentor who will teach us how to make our heart desire what the prayer talks about. After all, the point is not just to repeat the written words, but to reach a sensation deep in our hearts. A person’s heart should utter all the words of the prayer. We Can Change The Whole Universe! The Zohar, Chapter “Lech Lecha (Go Forth),” Item 4: The two lines that were moist and mingled with one another have not been frozen by the middle line, which is Tifferet, and will no longer mingle with one another. Only two lines descend to us from Above. Our job is to realize the Reshimot (informational records) that manifest in us and construct the middle line for them. 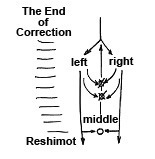 The two lines – the left and the right, the property of mercy (Rachamim) and that of judgment (Din), bestowal and receiving – influence the Reshimot. Both of them impact me and my Reshimo. My task is to realize both forces in an optimal way by using the Reshimo. This is what is called the middle or third line. My job is to use both forces that I receive from the Creator in the proper way within myself. How do I recognize these forces? How do I find ways to connect them together? In any state, along the entire ascent until achieving complete correction, I have Reshimot that must be realized. My next state is already given to me; I don’t have to search for it. All I have to do is learn how to connect both forces together and how to organize my next state in the most optimal way in order to become similar with the Upper One at every given moment. The Creator shaped both forces that come to me from Above. My job is to build a form from myself that is similar to Him with the help of these two forces and Reshimot. I have all the instruments handy: the engine (Reshimot) and “plus” and “minus” (the two lines). I only have to know for which purpose I “ignite” the system. All the tools are already available to me. I only have to add my own effort. Yet my work has to be applied not towards the construction of my new state, but rather to the realization of what I do and why I do it. By acting this way, I become similar to the Creator. Often times we think that we have to correct or build the whole world. But in fact, all we are required to do is to concentrate on a very easy task. Even though our work is extremely simple, it actually changes the entire reality. Why Is The Creator Concealed From Man? Question: Why is the Creator concealed from man? My Answer: In order to give us free choice for otherwise His apparent greatness would rule over us fully. Question: The Creator’s concealment… could we already be in bestowal, could we already be giving pleasure to the Creator, only it is concealed from egoism so as to not give it fulfillment? My Answer: Everything is measured only with relation to us. If you discover the Source of your pleasure and become completely fulfilled by it, it means you have achieved the goal. Dear Friends, please ask questions about these passages from the great Kabbalists. I promise to answer them. Commentaries in brackets are mine. And in order for the created beings to receive all the abundance and enjoyment without feeling ashamed for receiving it, the correction [of initially purposefully corrupted egoistic nature] was performed. And instead of tasting goodness and pleasure [from bestowal] in the commandments [the acts of correction of the desire to receive into the desire to bestow so as to become similar to the Creator] that we fulfill, we are unable to feel the taste that won’t make us ashamed while receiving pleasure. For this specific reason the correction [concealment of the Light, pleasure from bestowal and love] was performed whereby at the moment of receiving pleasure, we must act for the sake of bestowal since otherwise the concealment extends to our actions. – Rabash, Shlavei ha Sulam, “Sanctity and Purity in the Work,” 1991, pg. 28. A question I received: How can I keep being motivated “for the sake of bestowal” if I don’t see any results from my actions? Should I just blindly believe that the text I study is influencing me this way? My Answer: There is a two-fold problem here. On one hand, I have to ask for bestowal even though I’m not really interested in it. On the other hand, if suddenly by some miracle I do want to bestow, then I am still expecting the result of this action inside my Kelim of reception. But the reward for bestowal cannot come into those Kelim. Therefore, when a person does not see the result of his good, correct actions, which he might really be doing, it is natural because he is looking for the result in the wrong place. He is checking his wallet to see, “Where is my reward for bestowal? Where is the money, honor, power, health, or at least something?” But there are no results in these Kelim. On the contrary, they are twice as empty. You exerted so much effort, but you have nothing. It would be OK if you never made the effort. A person who doesn’t work doesn’t receive anything (even though he is ready to receive without working). In that case you can not complain. But if I bestow and do not receive anything, it is twice as bad. It is written, “The reward for a commandment is a commandment,” and, “The reward for a commandment is knowledge of the One who gives the commandment.” This means that I reveal the quality of bestowal that suddenly begins to surface in me, the Upper Force that governs everything. I suddenly start to have a connection with it. I may also feel that I have an aspiration to continue acting in this direction. This is the reward. If I have the opportunity to make contact with the Creator without any feedback from Him, then this is a perfect situation-bestowal in its pure form. The souls can only establish a contact with Malchut of the World of Atzilut if they are connected to one another. The science of Kabbalah describes reality in which everything is purposeful, and where everything is aimed at a single goal. A peel protects the fruit while it’s in the ripening process. Similarly, the Klipa protects us until we become ripe and get rid of it.